Look for an escape–from this movie. The Weinstein company’s No Escape is an over-the-top, absurd, and confused movie. Often times I can find something positive to say about even the worst of films, but this one IS the exception. Rumor has it that this movie was almost nixed from a theatrical release, and I can easily understand why that is. This film has no idea what it is, and tries to fit the tropes of multiple genres. Because of the state of confusion that this movie is in, the plot lacks adequate structure and the pacing is ridiculous. Is it supposed to be funny when people die??? Is it propaganda on not doing business in Asia??? Why are the events in the opening of the movie never explained??? I could go on and on. From the casting to the writing and direction, this film took events that actually happen in that part of the world, and treated them with irreverence and disrespect. Simply stated, don’t get trapped into watching this movie from which there is no escape. 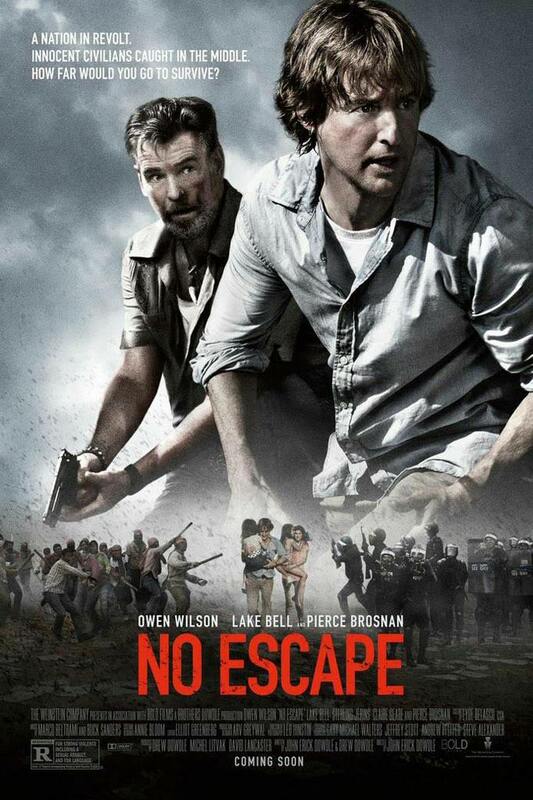 No Escape is about a family that relocates to Southeast Asia for a a bright new future. Jack Dwyer (Owen Wilson) and his wife Annie (Lake Bell) travel with their kids to the other side of the world in order for Jack to take a new job as an engineer with a water treatment company in (most likely) Cambodia. Upon arrival at the airport, they meet frequent British visitor Hammond (Pierce Brosnan) who offers them a ride to the hotel that both are staying in. The morning after Jack’s arrival, he finds himself in the middle of a civil war-like battle in the streets. Unbeknownst to Jack and his family, he and his coworkers are the target along with other Westerners. Virtually trapped in the small Cambodian town, Jack and his family, with help from Hammond, must escape to safety. Only, around every corner there are rebels who will stop at nothing until they see blood flowing from those they see as a threat to their way of life. As I mentioned in my opening paragraph, there is quite literally nothing positive I can say about this movie. Interestingly, it starts out with an intense scene that sparks excitement and suspense. So, I can understand how this film even got the green light. It did what all screenplays should do–capture the attention by showing something big/important within the first 3-5 pages. I suppose, that is kind of positive. But, had the producers just read the next several pages, they would have realized that this is a travesty of an idea for a film. And casting Wilson in the lead did not help the film’s case any. Unlike the performances in True Story delivered by James Franco and Jonah Hill, that proved these icons of comedy can play serious roles, Wilson just proves that he needs to be confined to comedies, satires, rom-coms, and parodies. The casting choice for Brosnan as the eccentric British traveler was acceptable, but his character also suffers from poor writing and direction. It is unclear what the message is supposed to be. On one hand, it can be read as a ‘don’t travel to Southeast Asia if you are a Westerner’ but it can also be read as a ‘the West needs to stop exploiting the East.’ Unfortunately, the message/subtext is opaque at best. Instead of treating the plot of this movie with the reverence it deserved, due to civil wars like the one depicted in the movie happen in that part of the world on a fairly regular basis, the movie plays it too close to a satire or dark comedy. It never quite crosses the threshold into blatant comedy, but it gets pretty close. There were numerous times that the audience laughed at the deaths of people. And understandably so, because the scenes, actions, and dialog were choreographed in such a way that they begged for chuckles and giggles from the audience. My roommate, who is originally from that part of the world, was made very uncomfortable by the movie due to the lack of respect for what real people face everyday in some parts of the world. There is a great lack of explanation for most of the scenes and motives in the movie. The events in the opening of the movie are never re-visited, despite the scene that follows states “17 Hours Earlier.” So, I am unsure what the significance was in the slaughter at the beginning of the movie. Furthermore, the entire reason for the revolt against Jack’s company and other Westerners is vaguely explained in some rushed exposition by Hammond. Even after his hurried explanation as to the source of the resentment that sparked violence, Hammond fails to actually explain in such a way that even Jack completely understands. It is like the explanation for the violence was an after thought–just stick it in there somewhere. If the intent of the movie was to highlight the fact that Westerners have been known to exploit the resources and workforce of the East, it should have been done in such a way that the movie did not make a mockery of itself. Went through other critic and user reviews, it seems the movie has came out surprisingly good for majority of the audience! Fair enough. I also looked at other reviews, as I often do. Still, I feel quite confident in my review of the movie. Thanks for the comment, though!